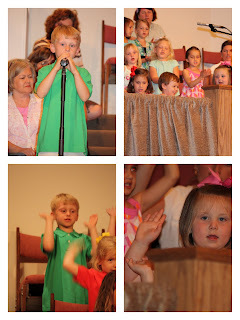 Tonight the kids had their "spring musical" at church. Jackson even had a speaking part and did AWESOME! He was the only one of the four that spoke clearly into the mircophone and the only one you could understand. We were very proud! They both sang and did the hand motions just like they were suppose too. Although the pictures are not very good... they both did a really good job!